I write as chair of the Alliance for Academic Freedom (AAF), a faculty group devoted to preserving and protecting academic freedom and committed to alerting both the higher education community and the public about the immensely damaging consequences of academic boycotts. I write as well as a former president of the American Association of University Professors (AAUP), which has categorically condemned all academic boycott since the first year of my AAUP presidency (https://www.aaup.org/report/academic-boycotts). 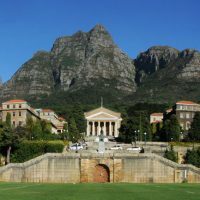 This Saturday the Council of the distinguished South African University of Cape Town is scheduled to take a vote that could place the institution outside the set of norms and values that define higher education across the world: it will vote on whether to initiate an academic boycott of Israeli higher education by cutting ties with Israeli colleges and universities. I urge you to reject this proposal. Eliminating present and potential study opportunities for South African students in Israel and Israeli students in South Africa will deny them the academic freedom to make their own independent educational choices. Eliminating existing and future research collaborations between Israeli and South African faculty and students will curtail the broad benefits that can result for both peoples from the research that universities are uniquely positioned to make. Eliminating the intellectual exchanges between the faculty, students, administrators, and staff of institutions in both countries will deny them the opportunity both to build mutual understanding and to challenge each other’s political beliefs and cultural assumptions. The free exchange of ideas and the support for open debate across international borders are the bedrock principles of higher education worldwide. Academic freedom protects the ability of faculty and students who disagree about national policies to remain in dialogue with one another. That dialogue provides the opening for the university community to promote policy changes. Curtailing that dialogue instead makes it more likely that objectionable government policies will harden in place. It is notable that the AAUP has never opposed comprehensive economic boycotts. AAUP staff members were active in the comprehensive boycott that helped eliminate the apartheid regime. But the organization opposes singling out university communities for punishment. It asks all to stand for the higher principle of academic freedom.